If you’re ever in Los Angeles you all have to stop by the CatCafe Lounge and say hi to some very happy cats. This beautifully designed cat cafe houses 35 to 40 adoptable cats in a spacious, light-filled room that is designed with the cats’ needs in mind. The 1800 square foot space is divided into the cafe area and the cat lounge, with 1000 square feet dedicated to the cats. As you can see on the floor plan below, two airlock entrances lead from the cafe into the cat lounge, an excellent design detail to prevent cats from escaping. There is a cat privacy room so cats can retreat if they are looking for some time out and a catio is currently being added. 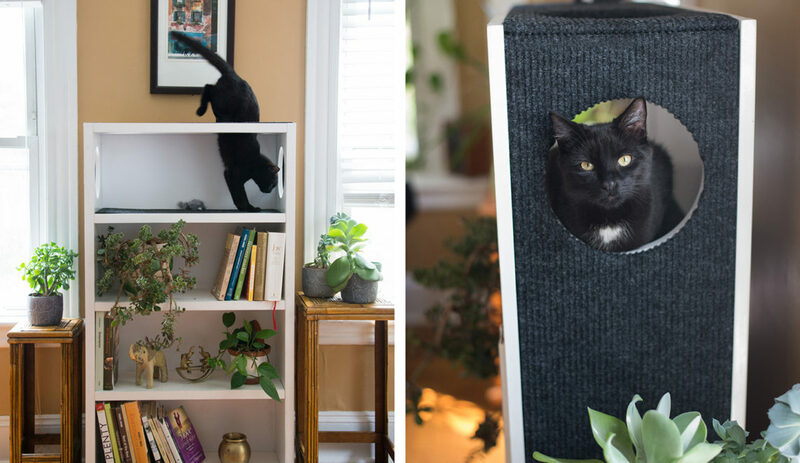 The space has endless climbing options for the kitties, including this custom tree in the center of the space, designed and built by Silverado Salvage & Design. Carpeted platforms lead up to a system of suspended walkways, such fantastic catification! The cafe section is bright and airy with big windows looking into the cat lounge area. Admission comes with a complimentary coffee or tea and they have other specialty snacks and beverages for purchase. You can grab a drink and take it with you into the lounge area. Black, white and pops of blue pick up the colors of the logo throughout the space, creating a clean and modern aesthetic. A narrower “transition zone” includes a custom birch forest climber, also from Silverado Salvage & Design, where shy cats can chill until they are ready to mingle in the larger area. Cats can access the cat privacy room via cutouts in the wall at ground level and from the shelf above. Always a great idea to have multiple entrances and exits into any smaller space, especially with this many cats! Big, bright windows let in plenty of sunlight and allow cats to view the neighborhood from the windowsill. Relaxing music creates a calming environment. Creative placement of basic shelves from the home improvement store gives cats plenty of places to run, jump, climb and perch while keeping an eye on visitors from above. The CatCafe Lounge is LA’s only non-profit cat cafe, so all proceeds go right back into the organization, helping to support their mission to save, socialize and adopt more cats. Reservations are recommended, since they limit the number of people in the lounge to 15 at a time. The space can also be reserved for private events. Visit catcafelounge.com for more info. 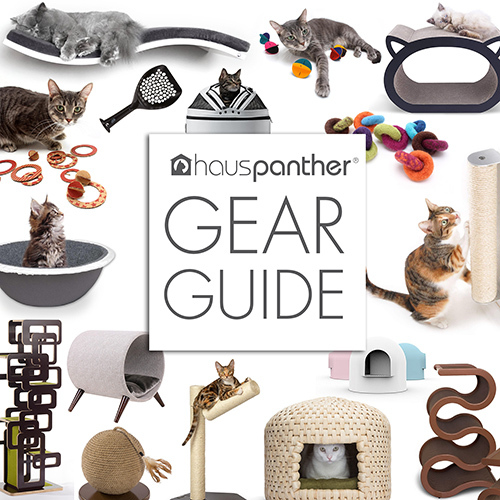 Such a beautiful, well-designed space and so many gorgeous cats — I wouldn’t mind living there myself if my three would agree! Thanks for sharing with us. This is fantastic! Love the idea that you ca have a tea or coffee, get some therapy visiting the kitties and maybe adopt a kitty!!!! I think there should be more cat cafes!!!! If I had the money I would love to build one in Southern Ontario!!! So cool! Wonderful for the kitties and hoomans!